Simeon Tshakapesh's teenage son took his own life in May. 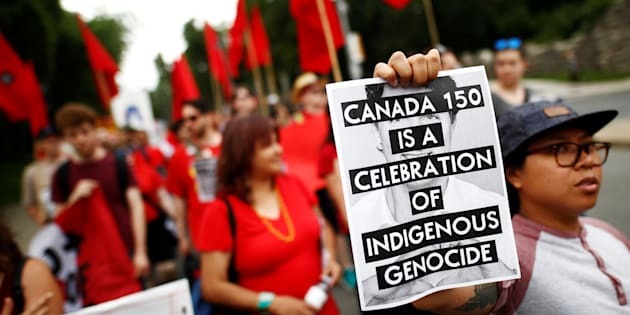 An indigenous rights activist holds a sign reading "Canada 150 is a celebration of indigenous genocide," after the "Unsettle Canada Day 150 Picnic", as the country marks its 150th anniversary in Toronto on Saturday. "I just lost my son. Who's gonna bring him back?" A Canada 150 picnic took an emotional turn Saturday as First Nations protesters confronted Indigenous Affairs Minister Carolyn Bennett. 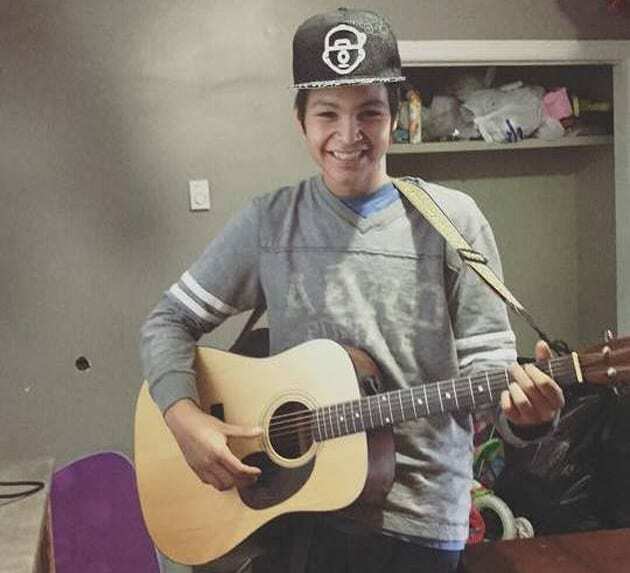 Innu Nation deputy grand chief Simeon Tshakapesh said that Canada's broken child welfare system killed his teenage son. "My son had a dream. And that dreamed was killed by the system," Tshakapesh told Bennett during a picnic she was hosting in her riding in Toronto for Canada Day. Tshakapesh marched on the picnic with protesters from Idle No More as part of the group's #Unsettling150 project. Holding signs that read "#Shame150" and "End colonial injustice," protesters beat drums and chanted. His 16-year-old son, Thunderheart, took his own life earlier this year, Tshakapesh told CBC News. Thunderheart's relatives asked Child, Youth and Family Services in Newfoundland and Labrador for help when he started abusing solvents. He was sent for treatment at centres as far away as Regina. Thunderheart lost touch with his family, ran away from the rehab centres, and got in trouble with the law. He spent two years away from home and then died by suicide in May. Sixteen-year-old Thunderheart Tshakapesh took his own life in May after spending two years in rehab centres across the country. "We bury our own kids when they return home. That is not the answer," Tshakapesh told Bennett on Saturday. "There's no need for this anymore. No more!" Bennett offered tobacco to Tshakapesh and promised that things would change for the Innu community, he wrote on Facebook. She spoke with many of the protesters and they were eventually welcomed into the picnic. "You know that I marched with Idle No More," Bennett told protesters, according to the Toronto Star. "You know that I've been fighting to make sure that the next 150 years are a lot better than the last." The Innu leaders had met with the minister on Friday, according to The Independent. They hoped to secure funding for their Placement Capacity Project, which would let Innu youth be treated in their own community. "But all we got were words," Innu Nation grand chief Anastasia Qupee said in a press release. "There were no concrete commitments." Bennett acknowledged that removing youth from their communities and culture was unacceptable and caused damage, according to The Independent. "They don't do well. We know secure personal cultural identity means better health, education, economic outcomes. This has to stop and I want to be a partner with you in those changes. "The decolonizing has to begin, and is beginning," she said. "We have to get you back in charge of child welfare and education." Solvent abuse is an "epidemic," in the Innu Nation, Tshakapesh has said previously. One 11-year-old child had to be hospitalized after sniffing gas in May. "They're doing it right on the street,'' Tshakapesh said at the time. Young people who need treatment are taken far away because services are just not available in the community. Out of 1,000 residents, there are 61 Innu children in care somewhere else. Alcohol and drugs plague the community, which is officially dry. Residents are struggling with the white way of life that was forced on them in a matter of decades, Tshakapesh has said. "The Mushuau Innu came out of the bush not even 50 years ago. We were a nomadic people,'' he said. "We're stuck in two worlds."